Born in Kardze in eastern Tibet in 1937, Kuzho Lama, Geshe Tashi Tsering has devoted his life to studying and practicing Buddhism and to conveying the essence of the Buddha’s teachings in cogent, powerful ways. He draws from an unbroken lineage of authentic teachings and presents them in a way that is relevant and highly meaningful to modern life. 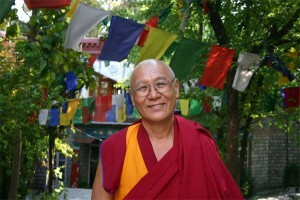 In Seed of Compassion: The Art of Happiness, Kuzho Lama will discuss the essence of Buddhist psychology which is deeply rooted in the ideal of compassion. He will explain the means for making our minds more positive in order to find happiness in this modern age.